I’m feeling a bit desperate here. I’ve had tetracycline stains for as long as I can remember. They’ve always embarrassed me, but for some reason now that I’m older, they seem to embarrass me even more. Like maybe I should have fixed this years ago but haven’t bothered. I finally dragged myself to my dentist about it and he wants to crown every tooth. These tooth are all healthy. I’ve never had a cavity in my entire life. I don’t like the idea of grinding them all down. Is there an alternative? Tetracycline stains are among the most challenging cases a dentist can face. Here’s the crux of the problem. These stains are so dark your dentist has to manage to get the coverage opaque enough to cover them, but translucent enough to look natural and beautiful. Some dentists try to make up for this challenge by doing dental crowns instead. There are two major problems with this. One is that you’re grinding down healthy tooth structure. The second is that crowns don’t guarantee the darkness will be covered. Then you’re stuck with crowns the rest of your life. Instead, you want the dentist who’s invested the time in training to develop the skills needed to do this the right way with porcelain veneers. It takes a combination of expertise in color theory and manipulation along with detailed knowledge of the properties in a large variety of porcelains. Only about the top 1-2% of dentists in the country are able to do this with good results. If you want to get the best results possible, you’ll want an accredited dentist with the American Academy of Cosmetic Dentistry. 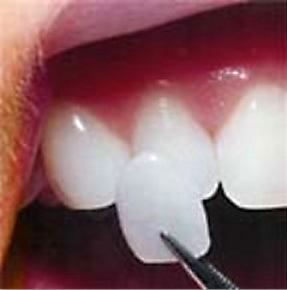 AACD accredited dentists have been extensively screened for both technical skill and artistry. They’ve passed stringent oral and written exams as well as provided visual evidence of the artistry they’ve accomplished on a large number of required cases. Anyone of them can give you the stunning smile you want, even with tetracycline stains. Though, it may require driving to another city for the procedure depending on where you live.